This week, Marketplace—public radio’s daily magazine show on business and economics—is visiting Missouri to explore how the deepening financial crisis and find out what’s really happening in the lives of Americans at home, at work, and in the community. You can hear Marketplace weekdays at 6:00 p.m. on KWMU in St. Louis. But Marketplace wants to hear from you about how are you and your community dealing with the financial crisis? Click here to share your experiences with Marketplace. 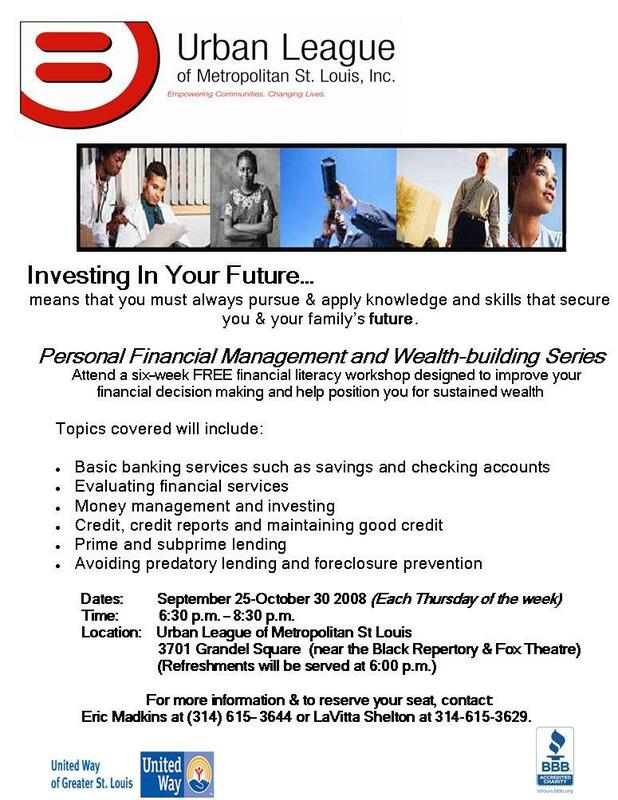 KETC community partner Urban League will host this series of workshops, which will cover topics such as financial literacy and foreclosure prevention. This event is free and open to the public. The collapse of some of the nation’s oldest financial institutions started on Main Street America with hundreds and thousands of homeowners such as 56-year-old Maureen McKenzie of Kirkwood who in May lost to foreclosure the small ranch house that had been in her family since it was built after World War II. How could this happen? The answer is … complicated. The Beacon will unravel the story of how Maureen McKenzie of Kirkwood, Mo., lost her 900 square feet of the American Dream. Read parts one and two. Nearly five months have passed since Maureen McKenzie moved out of her little white frame ranch on Barry Court in Kirkwood, and she is still trying to find her way through life-after-foreclosure. The house that was in her family for more than half a century now sits empty with a For Sale sign out front, while McKenzie has just moved again into her second apartment since the foreclosure. Looking back, McKenzie says, she always held out hope that her circumstances would improve and she would be able to refinance into a better mortgage. “Maybe I was just being stubborn,” she said. The collapse of some of the nation’s oldest financial institutions started on Main Street America with hundreds and thousands of homeowners such as 56-year-old Maureen McKenzie of Kirkwood who in May lost to foreclosure the small ranch house that had been in her family since it was built after World War II. How could this happen? The answer is … complicated. The Beacon will unravel the story of how Maureen McKenzie of Kirkwood, Mo., lost her 900 square feet of the American Dream. Read part 1. Maureen McKenzie’s father could tell she was nervous as he watched KETC-Channel 9’s “Facing the Mortgage Crisis” program that aired on July 15, but he was impressed that his daughter had stepped forward and disclosed her personal experience with foreclosure. “I don’t think I could have done that,” William Burns said. Burns, 83, said he did what he could to help his daughter save the home he bought in 1953 on Barry Court in Kirkwood. At one point, he gave her $6,000 — borrowed against her inheritance, he said — so she could catch up on her mortgage payments. Welcome to a new category of postings on the Facing the Mortgage Crisis blog. The idea behind this series is to clearly explain what some of the names, terms, and words that keep popping up in the news mean. Lately, a lot of articles and interviews addressing issues that supposedly affect us all are using language that most of us don’t understand. Figuring out what these unfamiliar terms mean in everyday language has helped me make sense of what is going on, and hopefully can do the same for readers of this blog. This term is used in reference to a couple of things when talking about the credit crisis. One is the liquidity of firms. This refers to whether a firm has enough easily accessible assets (cash, for example) to meet its obligations. A basic example of this is if a whole bunch of people go to their neighborhood bank to withdraw money, does the bank have enough to give them all the money that the bank has been holding for them? If not, they are insufficiently liquid. The other way that the term liquidity is used is in reference to assets. In this case, liquidity means that an asset can be easily sold because a) its value is known, and b) there are ready buyers and sellers. Right now, sub-prime mortgages are said to be illiquid, because there is uncertainty as to what they are actually worth. The collapse of some of the nation’s oldest financial institutions started on Main Street America with hundreds and thousands of homeowners such as 56-year-old Maureen McKenzie of Kirkwood who in May lost to foreclosure the small ranch house that had been in her family since it was built after World War II. How could this happen? The answer is … complicated. Over the next three days, the Beacon will unravel the story of how Maureen McKenzie of Kirkwood, Mo., lost her 900 square feet of the American Dream. McKenzie, 56, was on a self-imposed mission as she spoke those words during the July 15 segment of “Facing The Mortgage Crisis,” which was broadcast live throughout the St. Louis area. Still don’t quite get what’s going on with the credit crisis? You’re not alone. The recent financial news may have made it off the business page and onto the front page, but that doesn’t mean that the financial jargon has been left to the business section. On top of the insider’s lingo often used to explain the crisis, the issue is complex and ever-changing, making staying abreast of the news feel like a full-time job. Below are a few of the articles and stories that I’ve found most useful in understanding the root of current problems, and where we stand now. For an entertaining, easy-to-understand, yet not overly simplified explanation of the roots of the housing crisis, listen to This American Life: The Giant Pool of Money, or download a transcript of the show on the same site. You are currently browsing the Facing the Mortgage Crisis blog archives for September, 2008.